Slim and powerful. The current trend towards slim notebook cases also continues with MSI's current workstation lineup. A decent performance combined with a mobile and light case results in an interesting combination that should not be interesting for just professional users. We checked if and for whom the package works. The idea to equip a slim notebook chassis with powerful components is not really new. 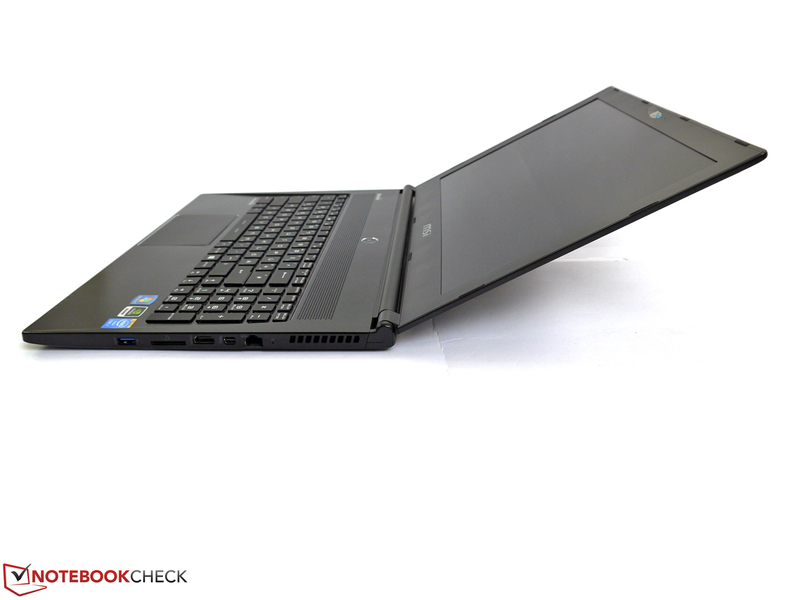 Dell's Precision M3800, or HP's ZBook 14 were role models and can be called very slim and light mobile workstations. 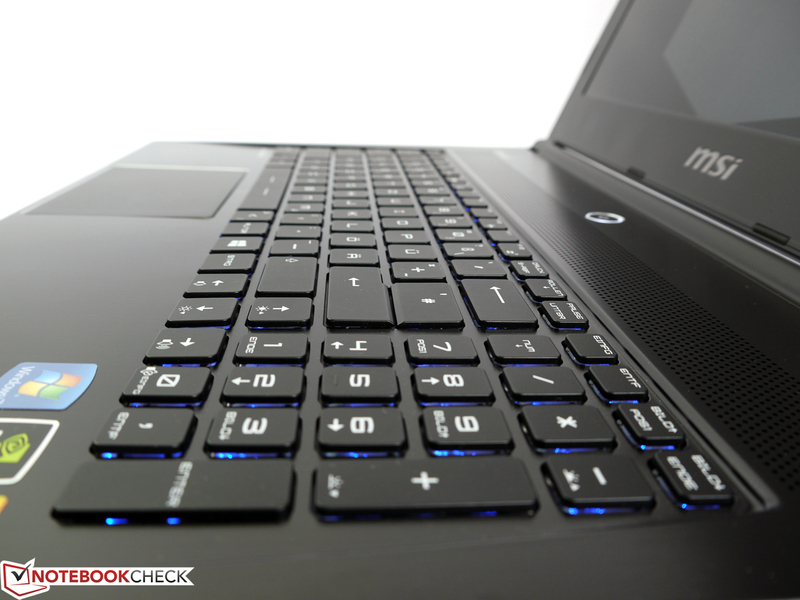 The MSI WS60 slimline notebook follows this trend as well. Thanks to the use of light case materials and energy-efficient components, the manufacturer aims to achieve high performance despite the limited cooling and chassis capacities. Our test device represents the current entry-level version of the series and is already well-equipped with a street price of around 1,800 Euros (~$2255). You get an Intel Core i7-4710HQ CPU, 8 GB RAM, 1128 GB storage (distributed among a Solid State Drive + hard drive), Nvidia's Quadro K2100M-GPU as well as an anti-reflective Full HD IPS panel. 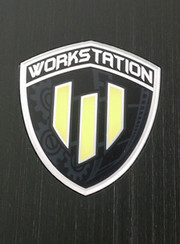 MSI has not developed a new chassis for its slimline workstation WS60. 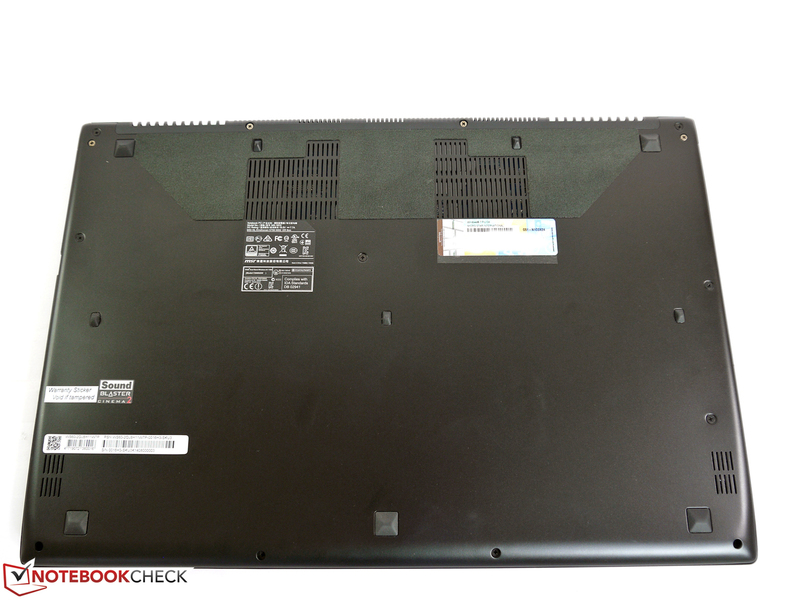 Instead, the manufacturer uses the case from the gaming notebook MSI GS60 without really changing anything. The gaming version had already dispensed with striking design features like glossy surfaces or intrusive chrome and colorful elements, so the WS60 is a pretty restrained device as well. Only the manufacturer's logo on the display cover reminds us of old Ferrari or Lamborghini editions with its design. This might actually be a problem for meticulous aesthetes or restrained constructors, architects or graphic artists. The pretty bright status LEDs at the front and the power button can be annoying, as they, unlike the keyboard illumination, cannot be dimmed. 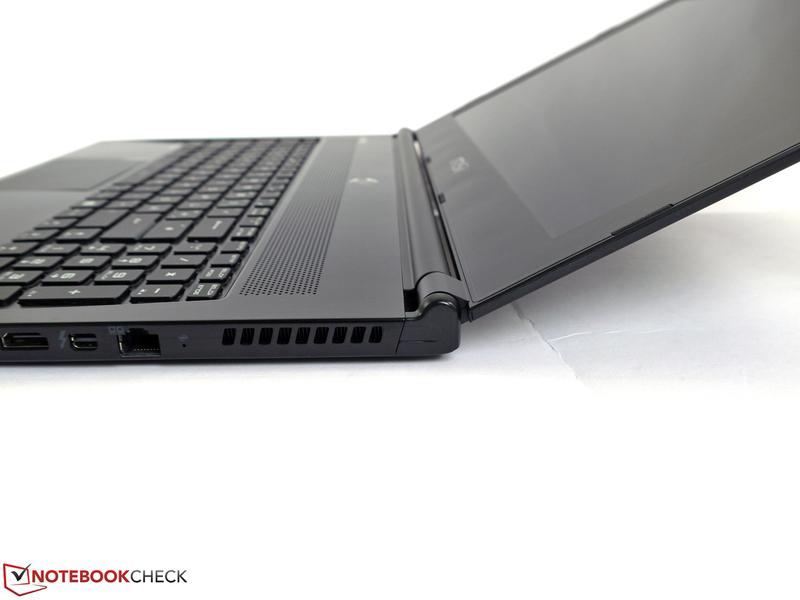 The case stability is up to a good standard, and can compete with other mobile workstations. 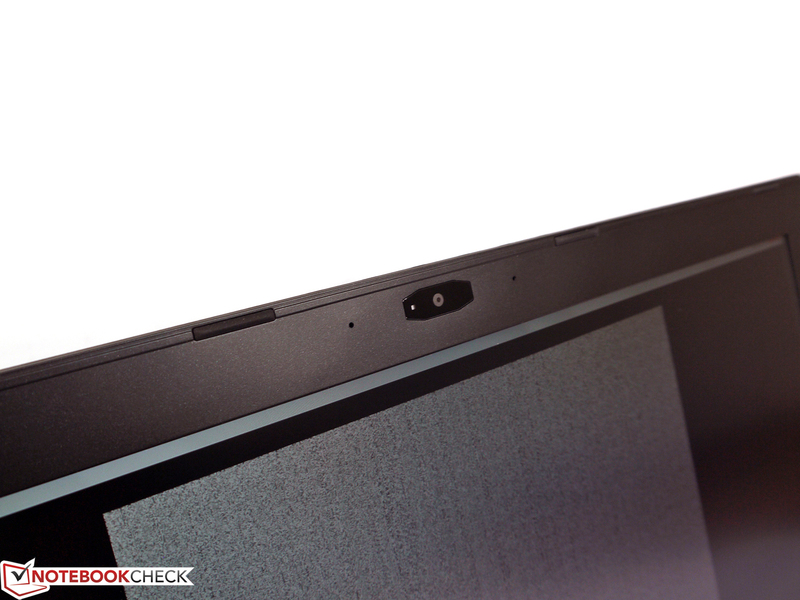 Only Dell's Precision M3800 (Dell XPS 15 chassis) is slightly better amongst the slim devices. The palm rest is firm and can only be pushed in at some spots with excessive force. The display cover on the other hand is pretty flexible and the hinge could be firmer at large opening angles. Considering the weight of around 2 kg (~4.4 lb), MSI has done a good job, and it should be sufficient for most professional users. Due to the slim construction design and the positioning of the cooling solution at the back, all ports are located at the sides. The distance between the ports could be slightly bigger to avoid any issues when using all ports. Connected cables also affect the use of a mouse on both sides. Otherwise, the port variety is decent; Thunderbolt 2 can be used for fast storage solutions or for external displays (Mini DisplayPort). Multiple unrelated devices will work simultaneously since you can attach them in series, similar to the outdated FireWire standard. Slightly older peripherals can also be attached via USB 3.0 and HDMI 1.4. 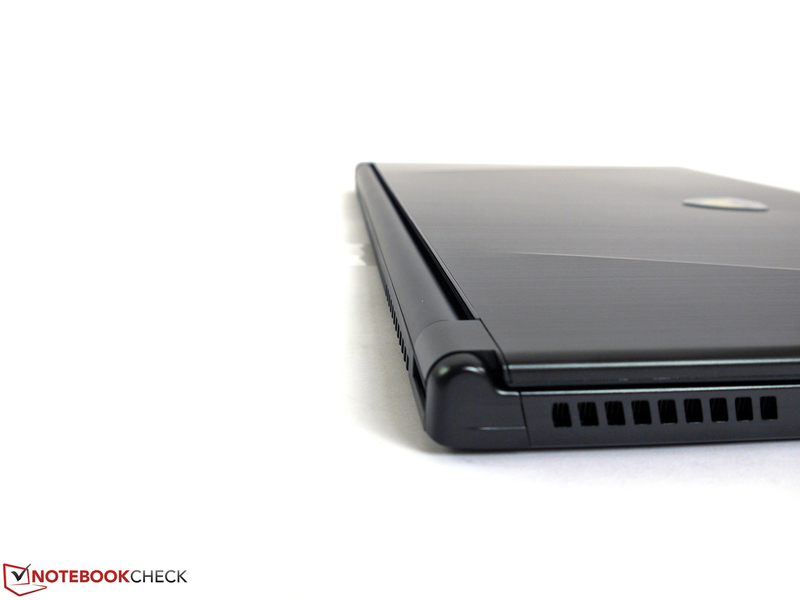 A dedicated docking port, an ExpressCard slot or a modular bay for drives or batteries are not available. The overall concept already suggests a decent set of fixtures in regard to the communication modules: Gigabit LAN, 802.11ac WLAN, Bluetooth 4.0, a Full HD webcam as well as an integrated microphone provide all the necessary hardware components for video chats, network tasks and wireless network connections via WLAN. Typical business components like a WWAN module (mobile Internet), an analog modem (for fax documents) or a serial port are not available, even as an option. The webcam takes nice pictures in good lighting conditions. 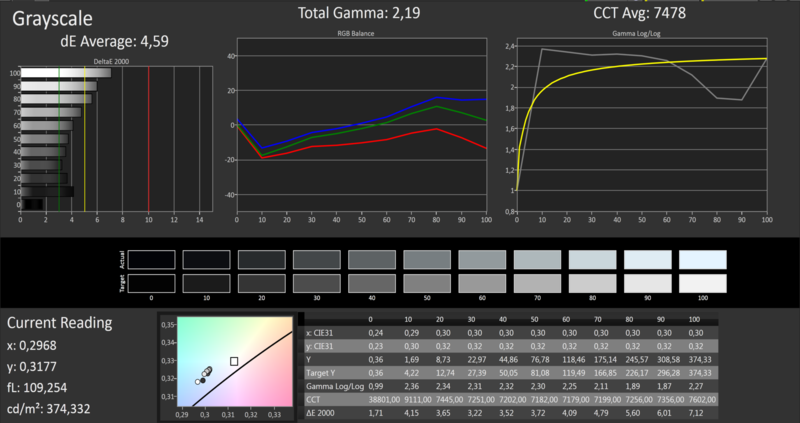 Poor conditions result in a significant drop in sharpness, brightness, and therefore picture quality in general. Neither the WLAN range nor the signal quality revealed any issues in our particular review environment; we measured around 6 Mbps at a distance of 2 meters (~6.5 ft) and around 2 Mbps at a distance of 15 meters (~49 ft; without direct sight) from the 802.11n router. 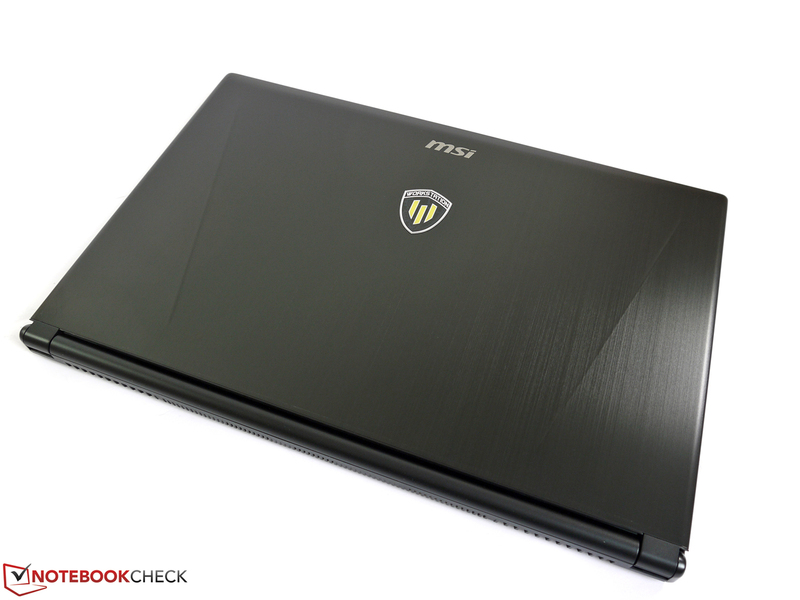 Apart from the usual BIOS and system passwords, the MSI WS60 does not have any special security features (SmartCard, fingerprint, TPM, Computrace, hardware decryption, etc.). This is another indicator that the basis of the notebook is gaming and not the typical business requirements. While not all features offered by real business rivals, are always used in every working environment, we would have at least expected an additional fingerprint reader for the MSI WS60 workstation. The maintenance options are pretty limited because of the slim construction, but still much better than Apple's MacBooks, for example. 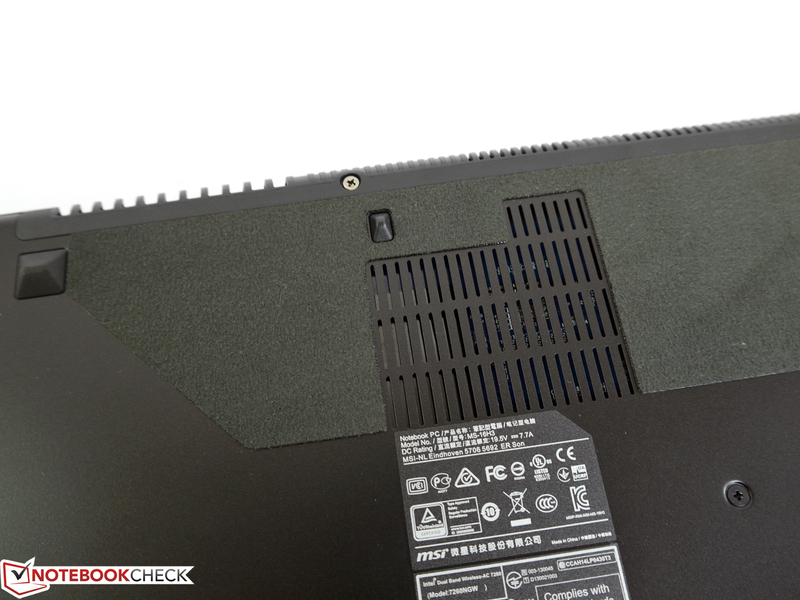 The bottom cover can be removed to gain access to the fan, the hard drive and the battery. Memory and M.2 SSD on the other hand, are located beneath the keyboard, and therefore harder to access. We did not find any instructions to replace the components in the pretty short manual or anywhere else. We contacted MSI, but they even recommend that the user does not replace any components at all. 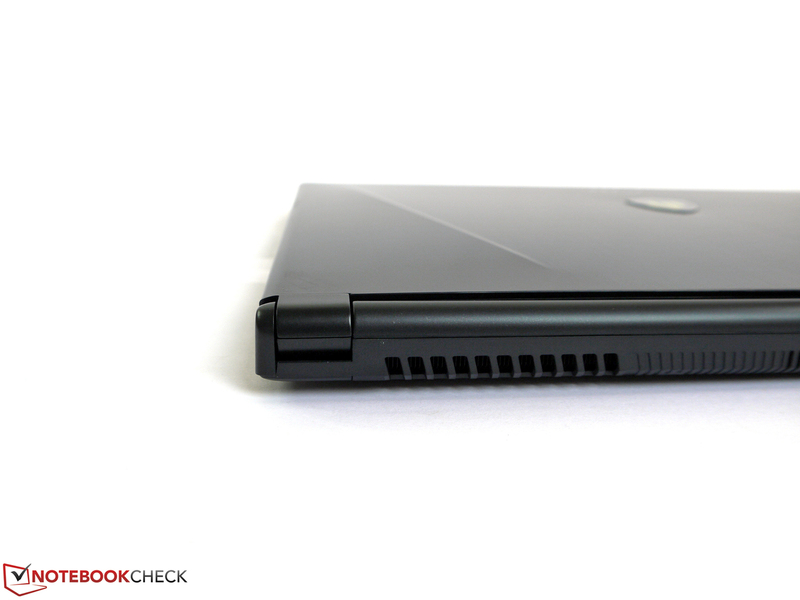 The slim chassis with the crowded internal layout, bears the risk of damaging other components. 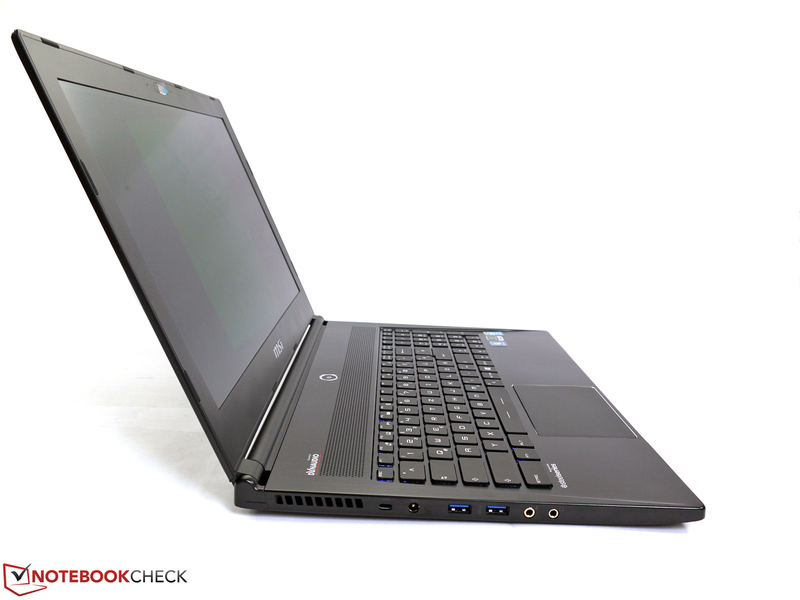 Unlike the usual MSI warranty period, the manufacturer offers a warranty of 36 months for its mobile workstations. The attached seal at the bottom also does not affect the warranty in all countries, but you should ask the manufacturer or the retailer to be sure. The keyboard is suitable for frequent writers with its large keys, soft stroke and a good pressure point. The font for the lettering and the slightly unusual layout, however, require some time to get used to. The separate numeric keypad improves the inputs of large rows of numbers, but also results in a shifted touchpad. The latter is not at the center of the palm rest anymore, but slightly shifted to the left. The integrated keyboard illumination can be configured with many colors and settings. 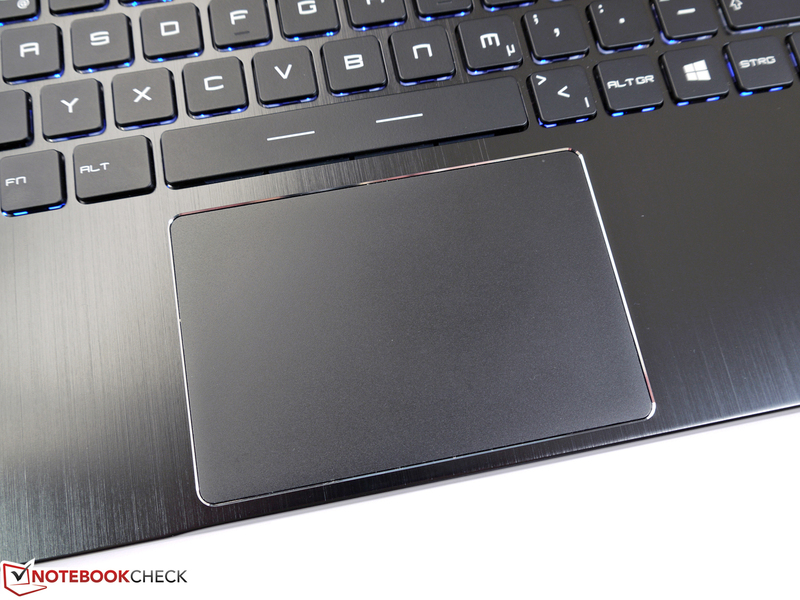 The touchpad has a size of around 10.5 x 7.5 centimeters (~4.1 x 2.9 inches), allowing sufficient room for multi-touch gestures. Gliding capabilities are good and inputs are recognized very reliably. 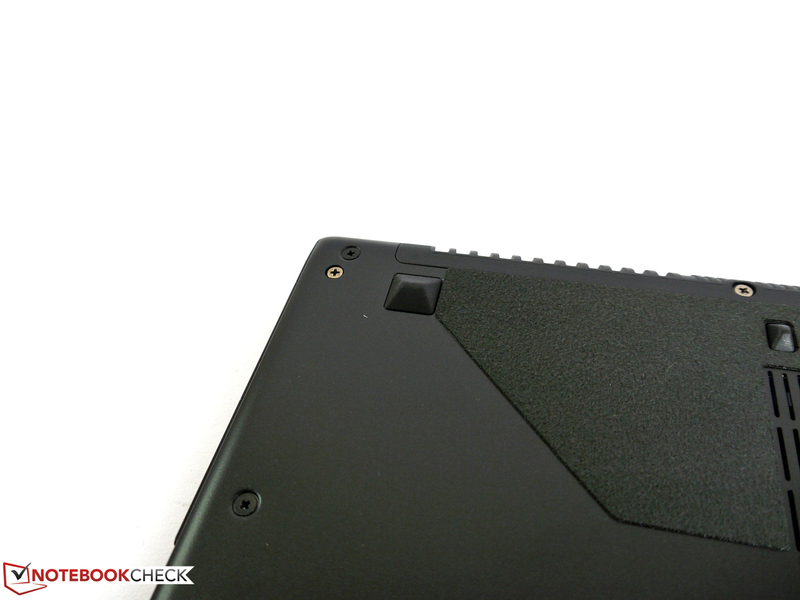 The integrated touchpad buttons are not as smooth as their counterparts in the MacBook Pro, for instance. However, you can also activate two-finger tapping in the Elan driver, which can compensate this drawback. 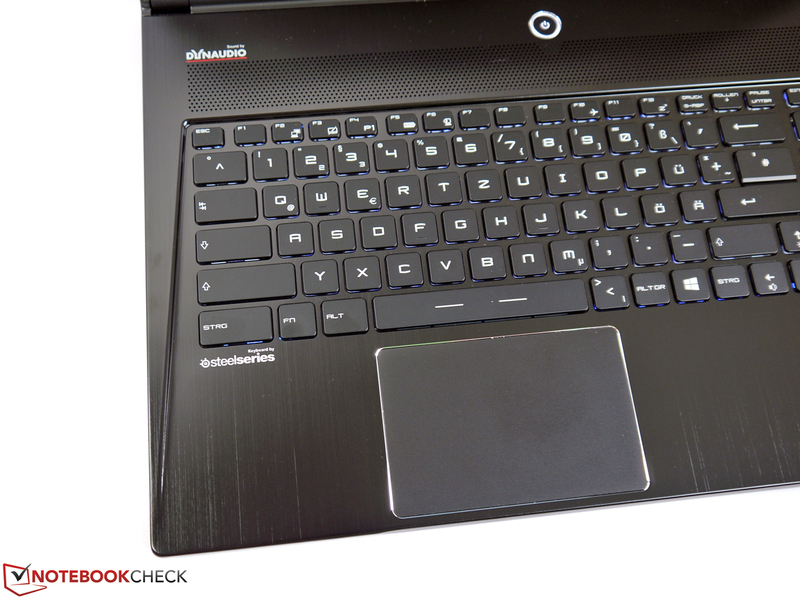 More impressions about the keyboard and the touchpad are available in the review of the similarly equipped MSI GS60. MSI shows no weakness in terms of the display. Depending on the configuration, the WS60 workstations are available with a 3K IPS display, which we have already reviewed in the gaming notebook MSI GS60, or with a Full HD IPS display from our review unit. An important advantage of the Full HD version is the almost completely anti-reflective panel surface, a must-have feature for a professional notebook. With 1920x1080 pixels on the 15.6-inch screen and a scaling size of 100%, you get a good ratio of available space and font/symbol size. Scaling issues, which are visible with 3K displays depending on the software, are no problem here. However, the picture is not as fine compared to high-resolution screens with 2880x1620 pixels, which is not only visible with pictures, but also with fonts and symbols. The average display brightness of 318 cd/m² combined with the anti-reflective surface means that working outdoors is not a problem. The maximum display brightness is not reduced on battery power, so there are no restrictions if there is no socket nearby. 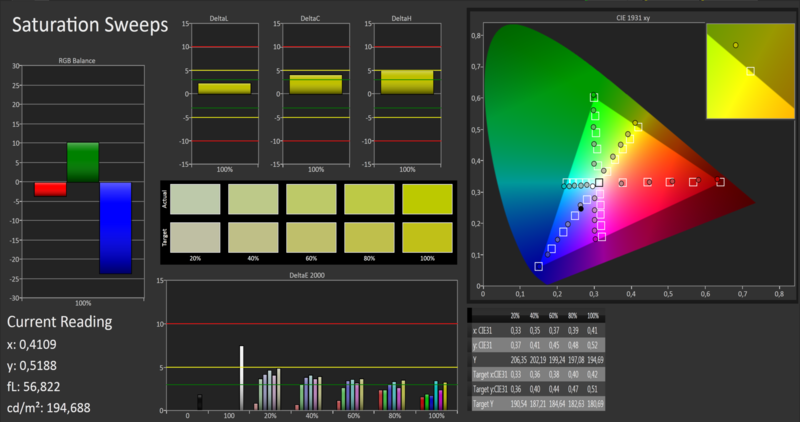 We can measure a very good brightness distribution of 90% and therefore a very even picture. Slight screen bleeding is only visible in the peripheral areas with dark picture contents, but they should not have any negative effects in practice. The brightness can be adjusted in 10 pretty linear steps: Our test device has a minimum brightness of 38 cd/m² and 143 cd/m² at setting 5. This value is sufficient for many indoor environments and represents an ergonomic alternative to the bright maximum luminance. A contrast ratio of 933:1 is a very good result for a notebook and creates rich colors and deep blacks. This is an advantage for movies, pictures and 3D constructions in particular. The color space coverage is not perfect, but 97% (Correction 20.5.2015 due to a wrong sRGB-reference-profile). 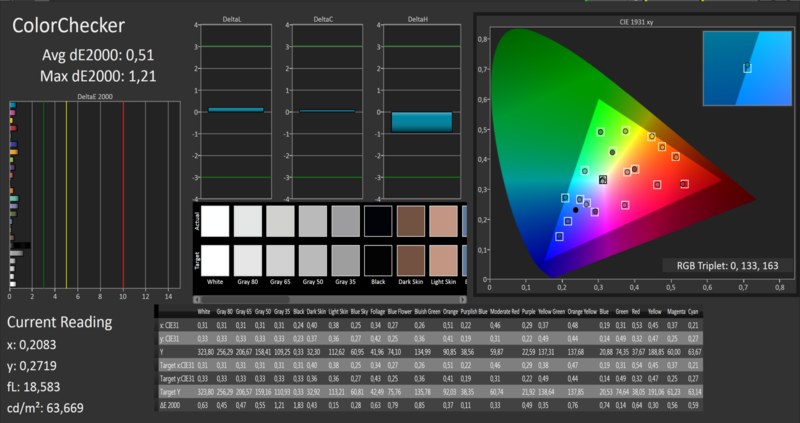 sRGB is a good result, and should be sufficient for many usage scenarios. 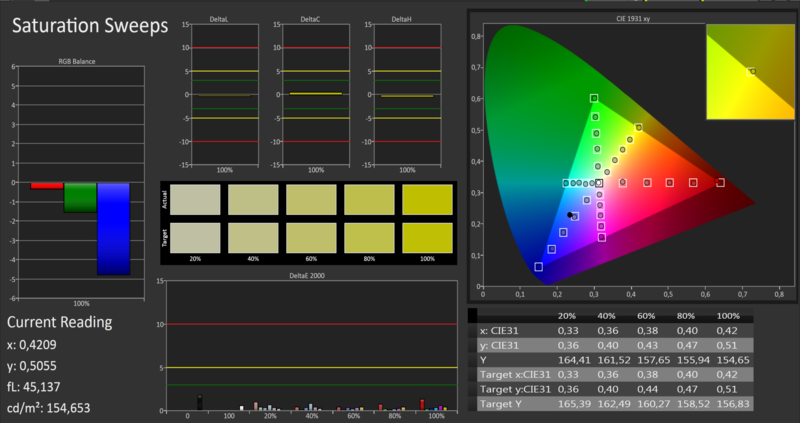 However, AdobeRGB98 is only covered by 63%, which might be too low for professional graphic artists or photographers. Other measurements, including the grayscale performance, color accuracy and saturation are, similar to the majority of notebooks, not perfect out of the box. 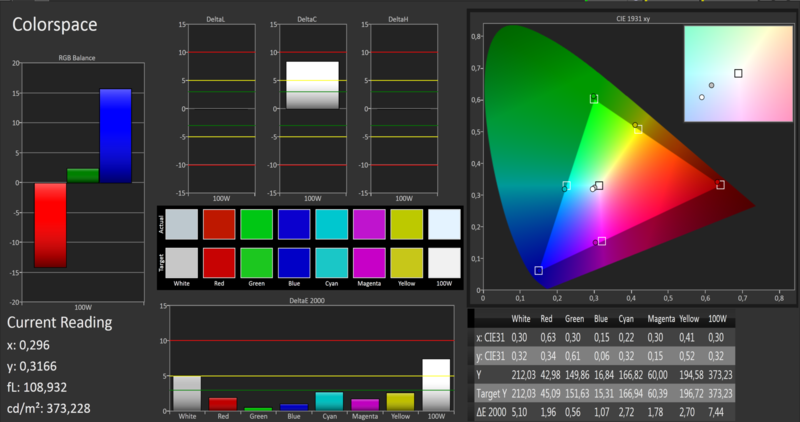 Calibration can help to utilize the maximum potential of the panel. The respectable results with the factory settings can be improved significantly. With maximum DeltaE2000 deviations of 1.41 for red and 1.83 for black, even the worst results are still far below the magical DeltaE2000 border of three. Deviations are usually only visible to the human eye if they exceed this value. 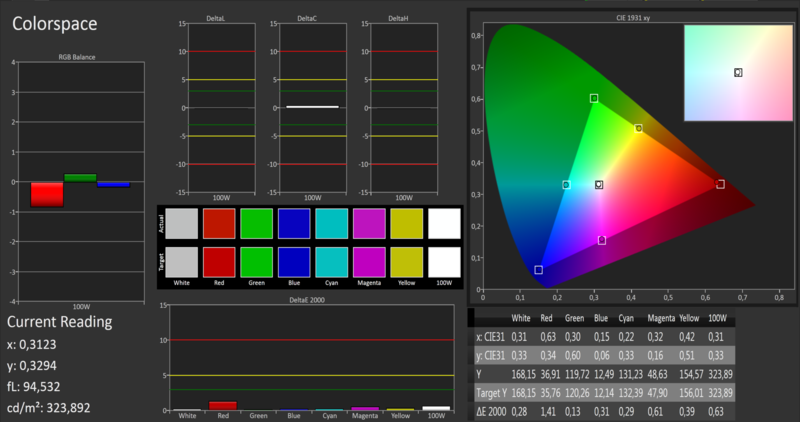 It is also hard to improve the RGB balance, the gamma curve, and the saturation values. The viewing angle stability is very good: You can only see minimal brightness and color changes from any side. 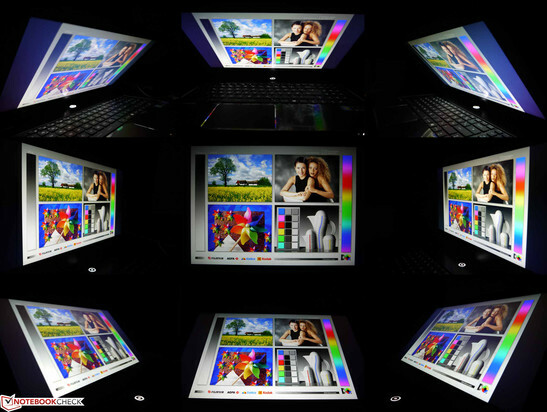 Negative aspects like inverted pictures, washed-out colors or color casts are no problem for the panel. 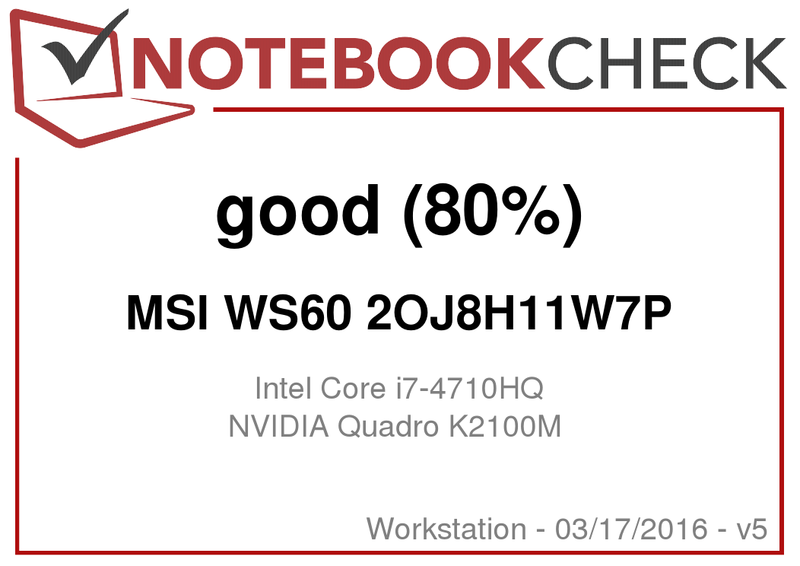 MSI always uses the same core components (CPU and GPU) for its WS60 workstations. 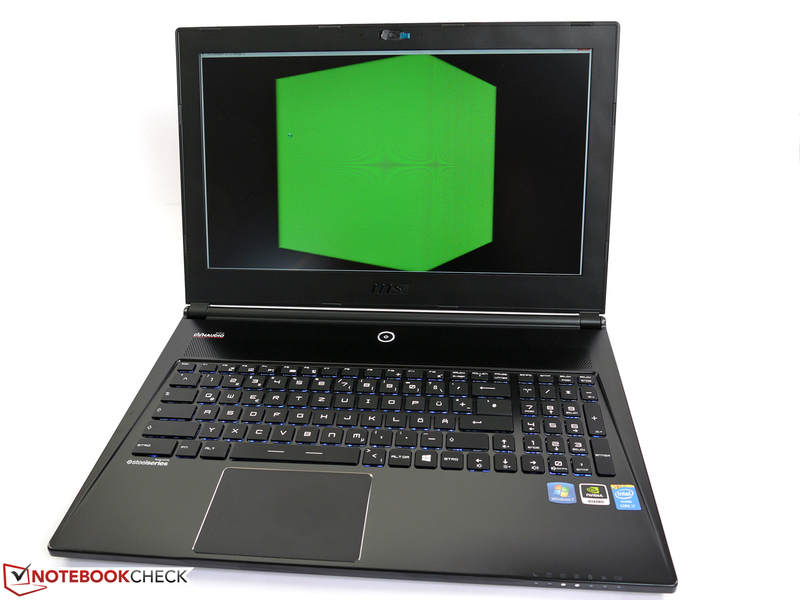 This is not a bad thing since both the Intel Core i7-4710HQ processor and the Nvidia Quadro K2100M graphics chip create a powerful combination that should be sufficient for many tasks. Possible performance differences can therefore be a result of the memory installed (8 or 16 GB), and the various combinations of storage solutions (SSD + hard drive or SSD RAID + hard drive). 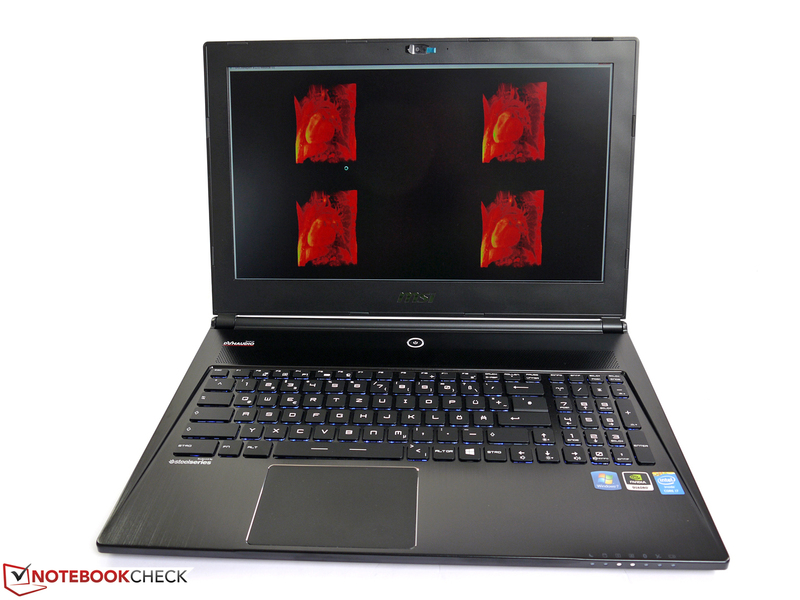 Our review unit represents the current entry-level configuration for around 1,800 Euros (~$2255), and is equipped with 8 GB RAM and the SSD-hard drive combination as well as the above mentioned CPU and GPU. 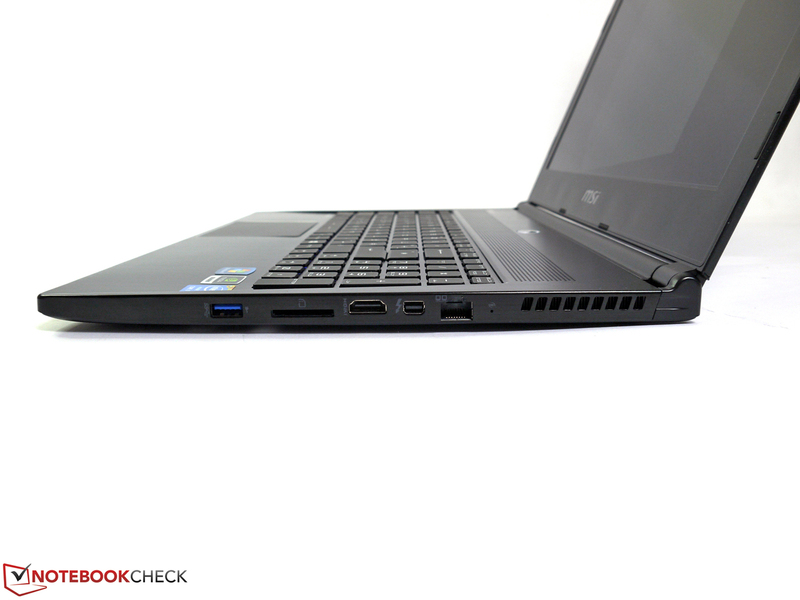 Intel's Core i7-4710HQ CPU is a powerful mobile quad-core processor. With a clock of up to 3,500 MHz via Turbo Boost or the simultaneous execution of up to eight threads, it should be fast enough for the majority of applications. The Cinebench R15 64-Bit Single test (benefits from a high clock), for example, determines 135 points and the Multi test (benefits from many cores and Hyperthreading) 645 points. This means the processor is among the top 20 fastest mobile CPUs in our CPU benchmark list. More performance comparisons with several benchmarks are available in our comprehensive CPU benchmark list. 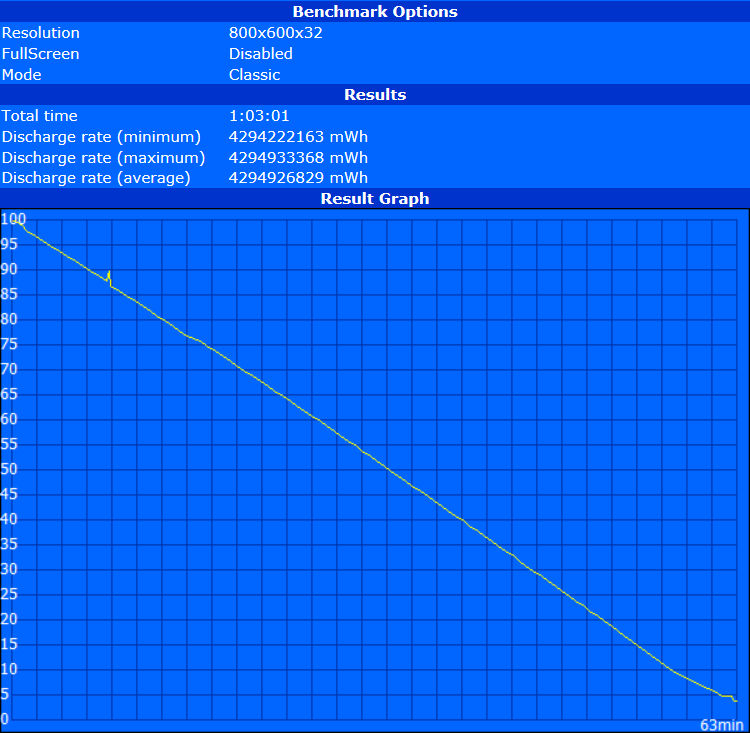 We can see that the performance slightly decreases on battery power. 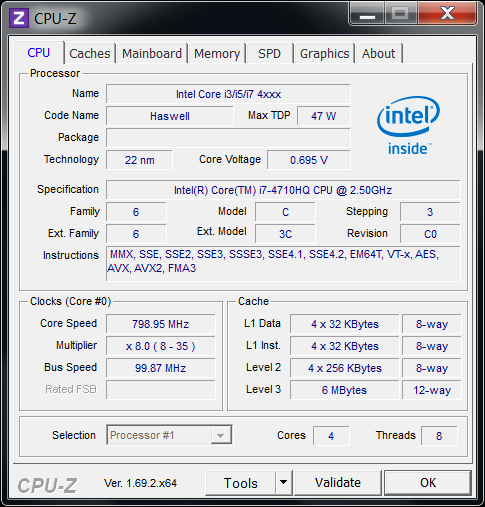 The maximum clock is limited to 2.5 GHz to reduce the power consumption and avoid short battery runtimes. The Cinebench R15 64-Bit results are roughly 25% lower with 98 points (Single test) and 501 points (Multi test). However, there is hardly any performance throttling under continuous maximum load with the connected power adaptor. 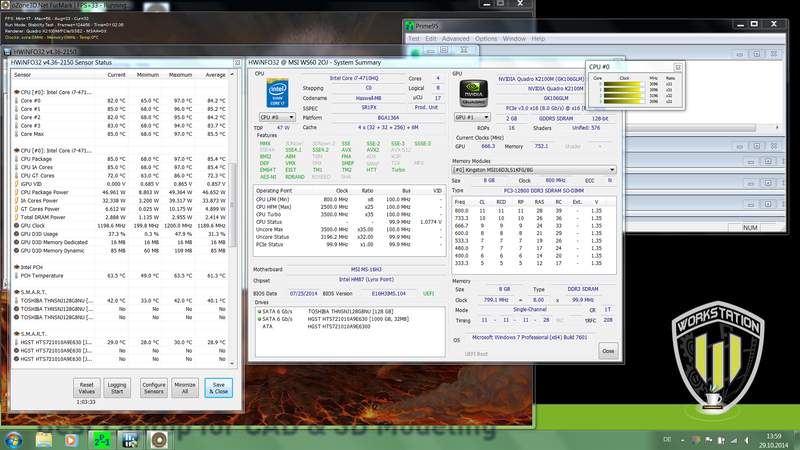 In this scenario (Prime95 + FurMark), the CPU is pretty steady with 2,900 MHz up to 3,100 MHz. 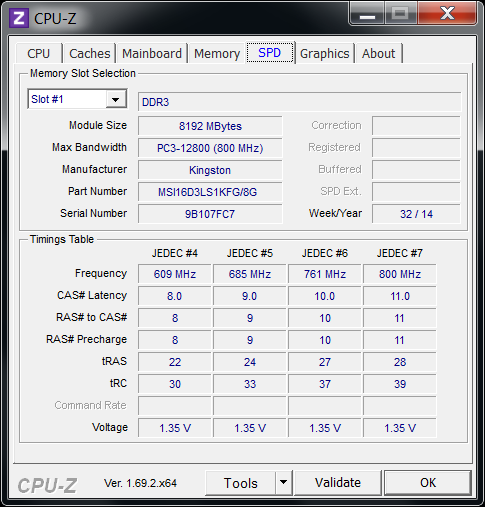 The clock increases to 3,200 MHz without GPU load. The choice of components is very well balanced in the case of the MSI WS60 and does not reveal any obvious bottlenecks. There is still room for improvements with regard to the memory and the M.2 system drive. 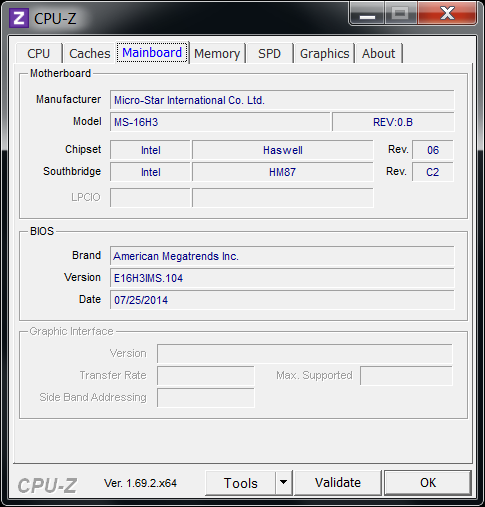 MSI has equipped our review unit with an 8 GB module, which is therefore not running in a dual-channel configuration. This does not only result in a lower memory performance, but the performance of the integrated Intel HD Graphics 4600 is reduced by roughly 20%. Another small issue is the low maximum write speed of the Toshiba Solid State Drive. However, it only affects the performance in some cases, for example, when you install applications or copy files to the system drive. Both drawbacks can be avoided when you choose the middle configuration (currently around 200 Euros; ~$250 more expensive) since it is already equipped with 16 GB RAM and an SSD RAID with two 128 GB drives. 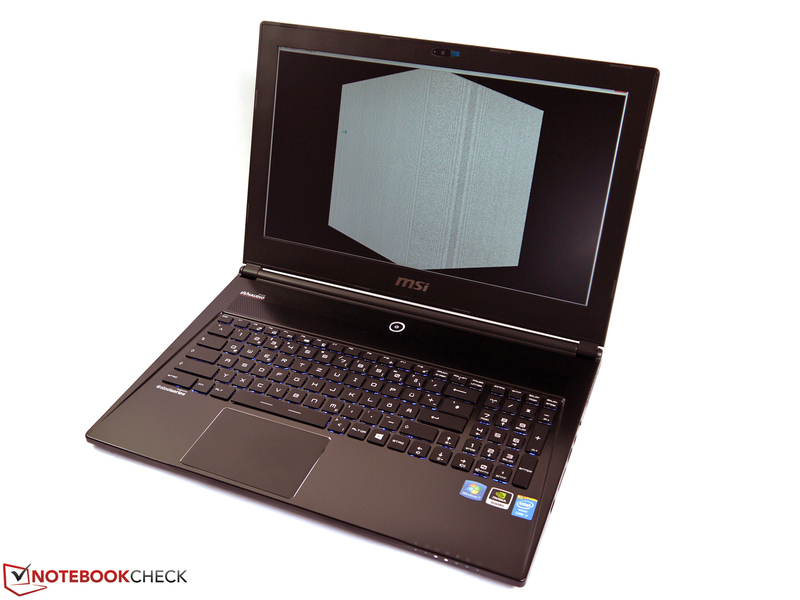 Despite these small issues, the test device still manages good results in the benchmarks. PCMark 7 determines 4,680 points and PCMark 8 (Work) 4,558 points. 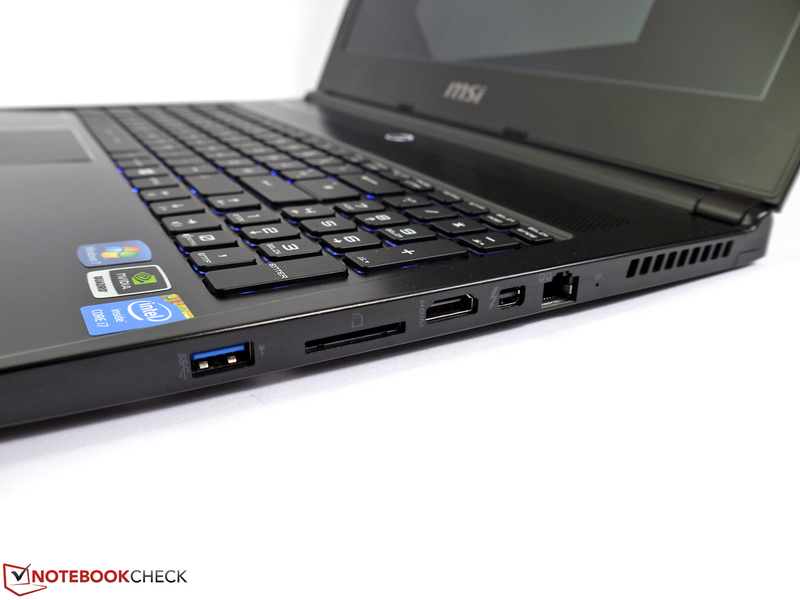 Even the entry-level version of the MSI uses a pretty decent combination of a fast M.2 SSD and a big 1 TB hard drive. With a gross capacity of 128 GB (76 GB are available after the first start), the system partition is sufficiently sized on the Solid State Drive, and should satisfy most needs. The read speeds reach up to 512 MB/s, which supports quick application launches and the opening of files. However, the Toshiba drive is not up to date anymore when you write files with transfer speeds of just 100 MB/s. This is not a huge issue for a system partition since there are usually more read than write operations, but there can still be small performance restrictions when you install applications. If you need higher transfer rates, you should probably get a version of the WS60 with an SSD RAID, which would provide better writing results. The manufacturer did, however, choose a good hard drive: With a transfer rate of up to 130 MB/s, the drive from HGST is pretty fast, even the average result exceeds 100 MB/s. This is still pretty slow compared to modern Solid State Drives, but it is well suited for its job as an inexpensive storage drive with a high capacity. More comparisons can be found in our comprehensive HDD benchmark list. 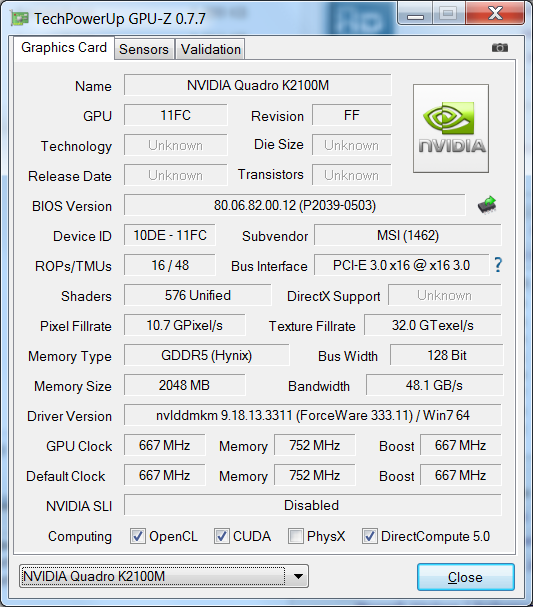 Nvidia's Quadro K2100M is a mainstream professional mobile GPU. 2 GB of GDDR5 video memory, 128-bit memory interface, 667 MHz core clock and 576 shader units are the specifications of this special solution for professional tasks. 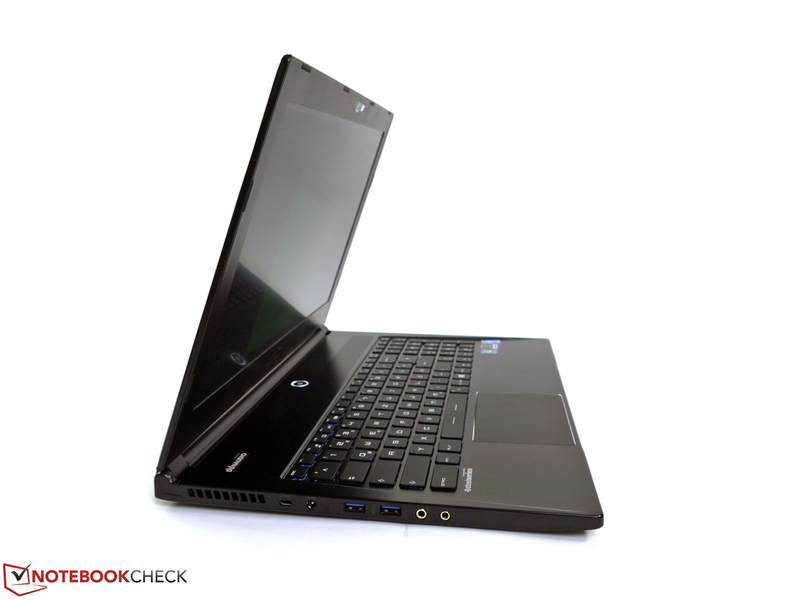 The CPU also provides the integrated HD Graphics 4600 for less-demanding tasks. The GPU switching is done either automatically or by program assignment via Nvidia Optimus, by the user. As we have already seen in previous reviews, the performance of the Quadro K2100M is between the Nvidia Quadro K1100M and the Quadro K3100M. Compared to AMD's FirePro W4170M, you have to look closely for the range of applications. FirePros are usually better in Lightwave, Maya and SolidWorks compared to the Quadros. If you use OpenCL performance or Raytracing, you should not focus too much on the Nvidia solution. The Quadro K2100M manages 154 samples/s in the Lexmark Sala test (Raytracing), for example, while AMD’s FirePro W4170M in the Dell Precision M2800 reaches 462 samples/s. Even though the comparatively weak graphics hardware has an advantage over the familiar consumer chips in professional applications due to its optimized drivers and a special BIOS, this has no effect on the usual DirectX applications. These scenarios require raw hardware performance, which is somewhere between an Nvidia Geforce GT750M and an Nvidia GeForce 840M. 3DMark 2011, for example, determines 2,553 points and 3DMark Fire Strike 1,645 points. 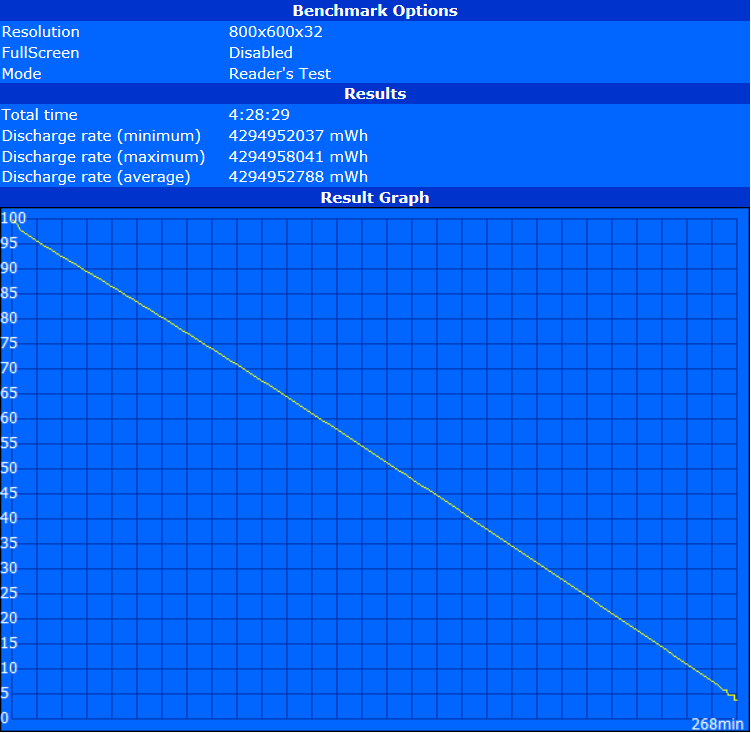 Further results and performance comparisons are available in our comprehensive benchmark list of mobile graphics cards. Unlike the CPU, we could not determine any throttling of the clock under maximum load on battery power. 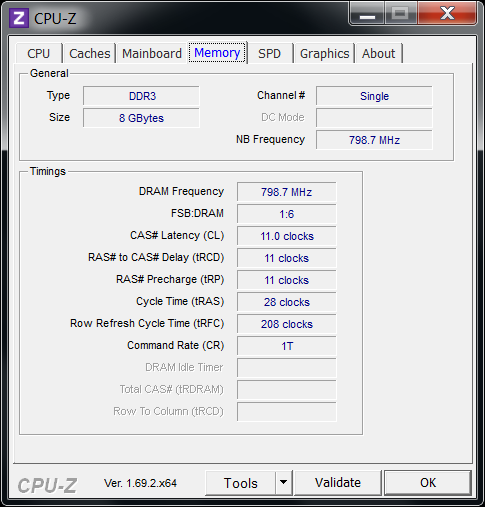 Our measuring tools show a steady core clock of 667 MHz, and it did not reduce even after 1 hour maximum load with Prime95 and FurMark. This is also the reason that the additional benchmarks on battery power are on par with the regular tests on mains power. 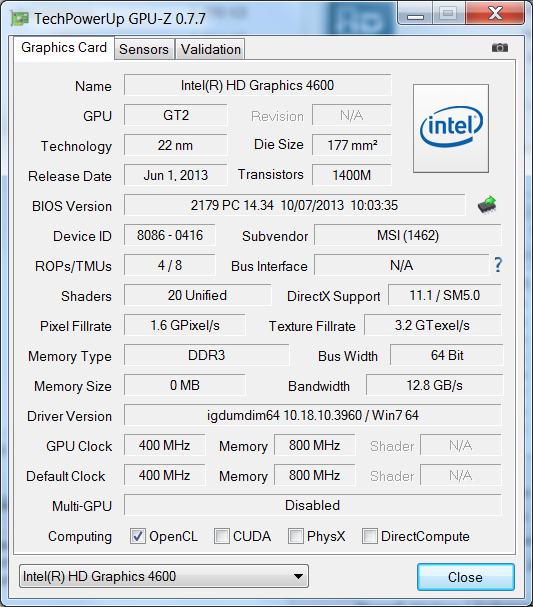 The Cinebench R15 64-Bit OpenGL test, for example, determines 64.5 instead of 66.6 fps. 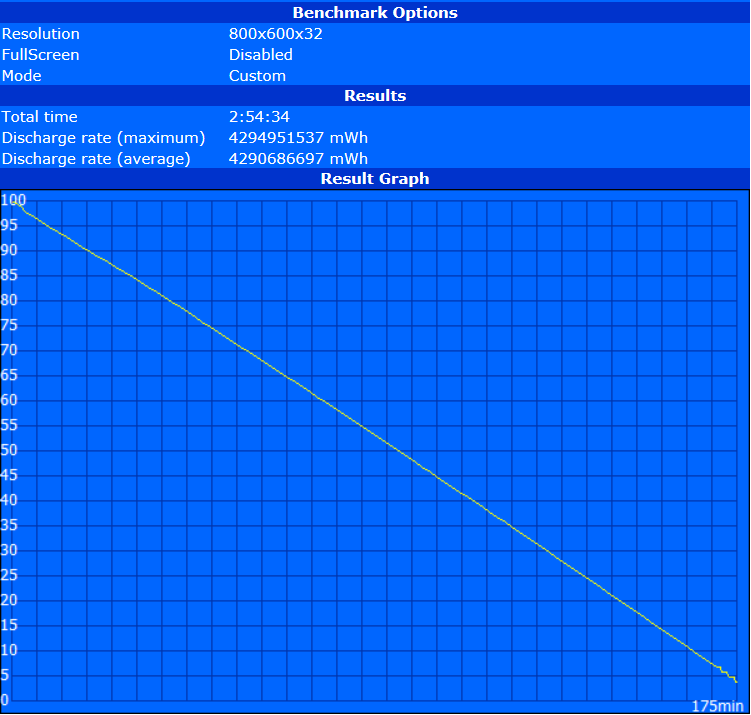 Similar to the DirectX benchmarks, the gaming performance is comparable to the Nvidia Geforce GT 750M. As with the consumer chips, there can be significant differences depending on the title and driver version. The performance is usually sufficient for many current titles, even though you cannot use all the details and high resolutions. 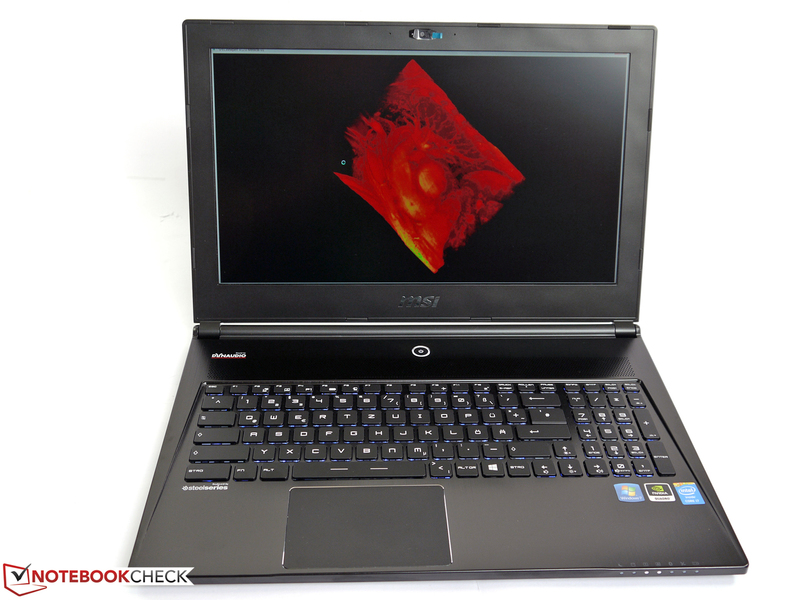 More gaming tests of the Nvidia Quadro K2100M can be found in our reviews of the Toshiba Tecra W50 and the Dell Precision M4800. The system noise during light workloads is dominated by the continuously spinning fans with 30.4 dB(A). They are active all the time and cannot even be silenced with an option in the BIOS. The even quieter murmur of the hard drive can only be heard when you get very close with your ear. 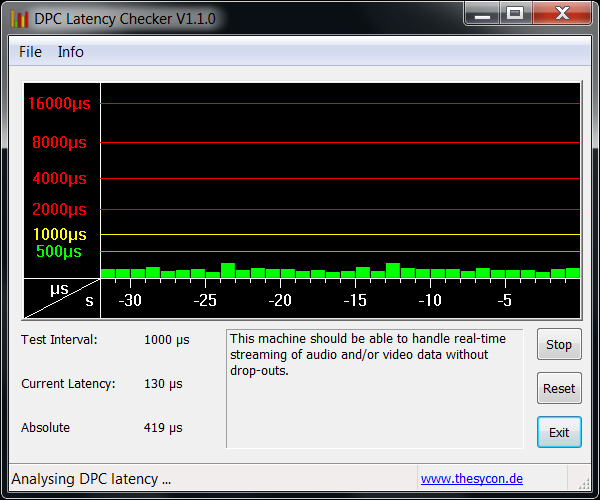 The fan noise is pretty perceptible in general, but stays in the background and should not be annoying for most users. Alternatives that are much quieter with light workloads would be the Dell Precision M2800, HP ZBook 15 or Lenovo's ThinkPad W540, for instance. Medium workloads result in a clear rpm increase of the two fans at the back with a maximum noise of 36.6 dB(A). This is still tolerable for a prolonged period and should not result in concentration problems. We simulate maximum load with Prime95 and FurMark and can measure up to 42.3 dB(A). It seems that this is the maximum fan speed; the cooling solution manages to keep the components comparatively cool. MSI’s cooling concept with two fans at the back pays off in the case of our review unit. We could only measure up to 47.7 °C (~118 °F) at the bottom, even after one hour of maximum load. Other areas easily stay below 40 °C (~104 °F). The palm rest and the keyboard stay pretty cool, so there are no restrictions even under high load. The surface temperatures are much lower with less demanding tasks and benefit from the continuous running fans. With up to 35.1 °C (~95.2 °F), there is no problem to use the device on your lap. (+) The average temperature for the upper side under maximal load is 31 °C / 88 F, compared to the average of 31.1 °C / 88 F for the devices in the class Workstation. (+) The maximum temperature on the upper side is 35.1 °C / 95 F, compared to the average of 37.1 °C / 99 F, ranging from 23 to 69.8 °C for the class Workstation. (±) The average temperature of the palmrest area of similar devices was 27.8 °C / 82 F (-1.3 °C / -2.4 F). 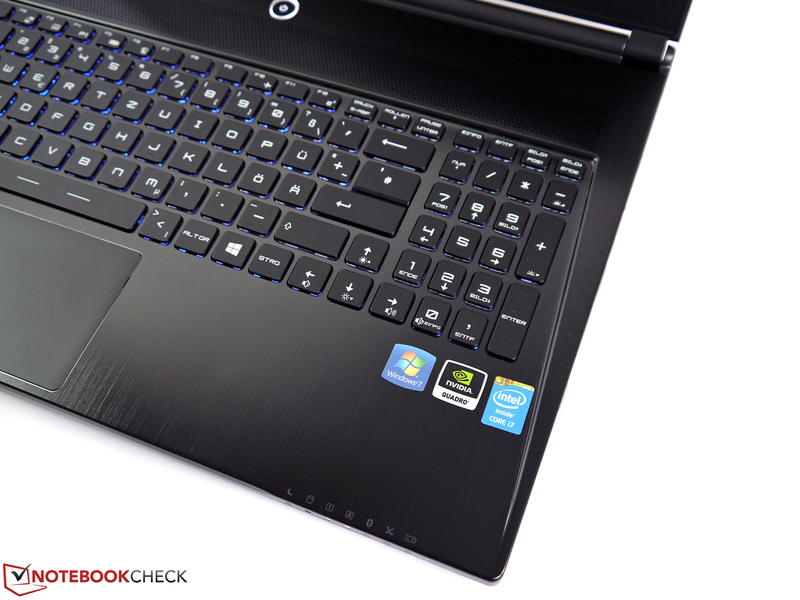 Thanks to the similarities with the gaming notebook GS60, the sound quality is surprisingly good for a workstation. MSI integrated two subwoofers and two regular speakers. The sound characteristics are pretty balanced, but there is almost too much emphasis on the bass. The provided Soundblaster software also provides comprehensive settings to adjust the sound according to your preferences. According to the online spec sheet on the German website of the manufacturer, the WS60 is supposed to have an SPDIF connector with support for 7.1 sound, but we could not find it in the review unit or the similar gaming notebook GS60. The feature is not even mentioned on the American product site of the WS60, so we guess this is just a mistake. Unfortunate. The minimum power consumption (Intel HD Graphics 4600) in the energy-saving mode, and with the minimum display brightness is very low at 8.8 Watts, and it is even further reduced to 7.3 Watts with a completely deactivated display. Here we can see that MSI adjusted its system well and integrated frugal components. 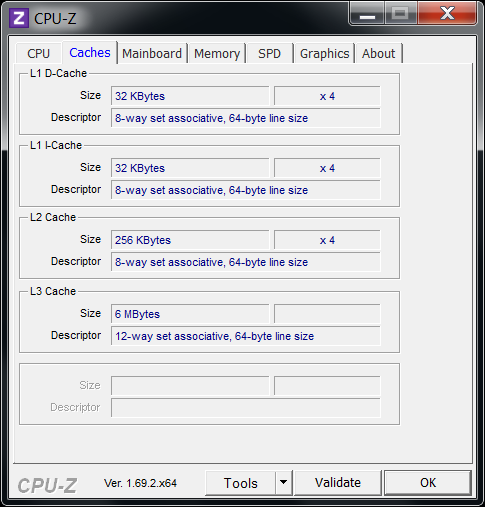 The maximum consumption while idling is mainly a result of the high-performance profile, which uses the CPU in combination with the Nvidia GPU. The display has a pretty low impact with a consumption of around 5 Watts at the maximum brightness setting. HP’s DreamColor display in the ZBook 15, for example, resulted in a consumption difference of 10 Watts between turned off and minimum display brightness. The measured load consumption rises to 84 Watts at the socket and up to 111.7 Watts under maximum load. This means the provided power adaptor with a nominal output of 150 Watts is sufficient and even has some headroom. The integrated 52 Wh battery is a concession to the slim construction and also prevents the use of additional batteries that could improve the runtimes if necessary. This means that in practice you can use the notebook for around 3.5 hours under light workloads before you require the power adaptor. 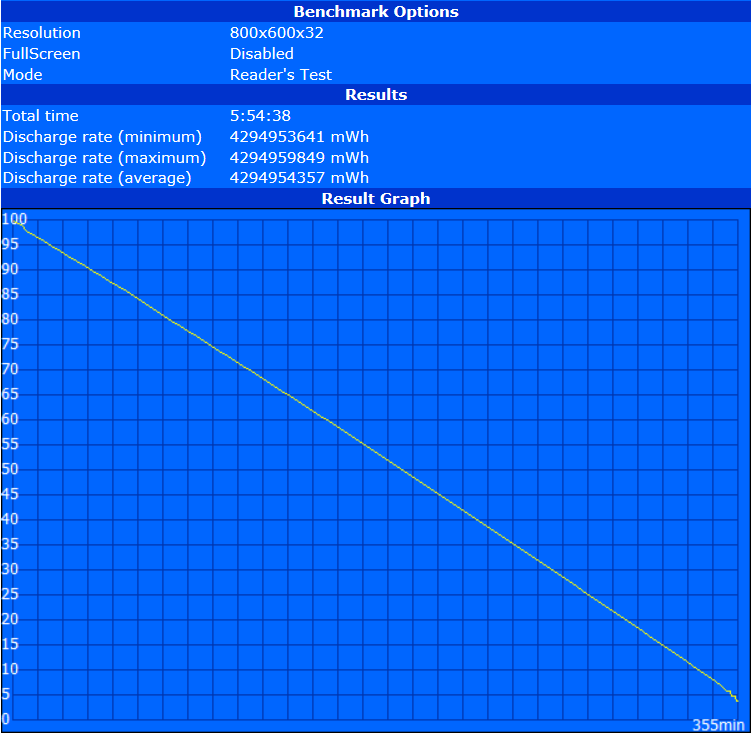 The Battery Eater Reader’s Test (minimum display brightness, energy-saving profile, plane mode, Intel HD Graphics 4600) determined a maximum runtime of almost 6 hours, but with the low luminance, the plane mode and the minimum load, this is just a result that can be achieved under ideal conditions; complex tasks will quickly reduce the runtimes. The Battery Eater Classic Test (maximum brightness, high-performance profile, everything on, Nvidia Quadro GPU) results in a runtime of around 1 hour, even though the CPU clock is already throttled to 2.5 GHz. 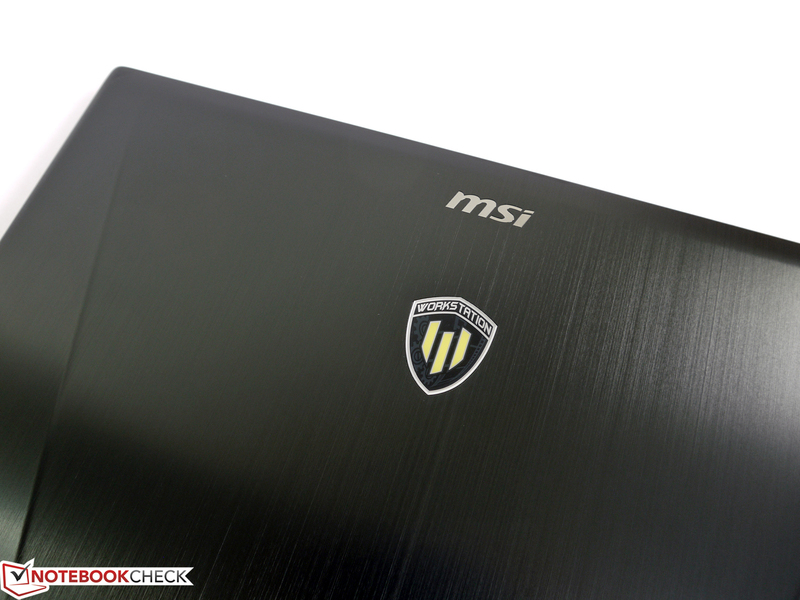 MSI has a conveniently individual take on the topic of a mobile workstation. 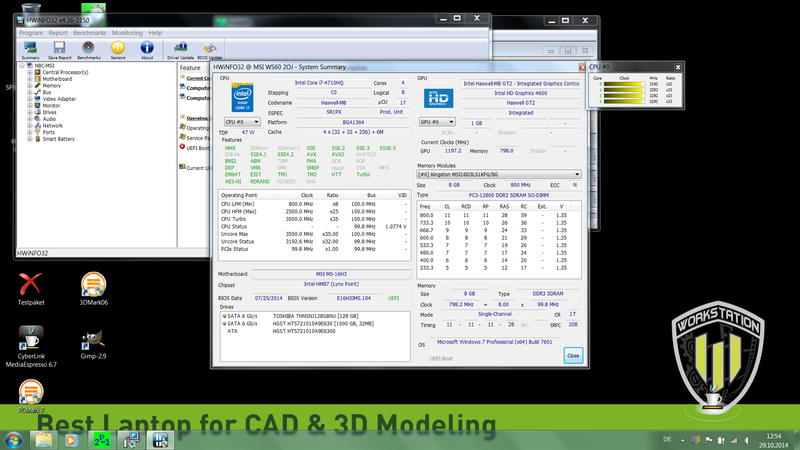 For an attractive price, the manufacturer dispenses with the otherwise usual business features, and concentrates on the core competencies of a workstation instead. Features and performance are decent and can easily keep up with the sometimes considerably more expensive rivals. The small performance disadvantage of our review unit can also easily be avoided with another (more expensive) configuration. Apart from the mentioned performance, the matte Full HD display in particular is a good selling point. We almost could not find any problems with the panel, only the sRGB color space is not fully covered, which might be a problem for some professional users. We also like the sufficiently sturdy and also slim case. The usual drawbacks like high emissions or the limited maintainability are not a huge problem and MSI found a decent compromise for the WS60. Still, there are some limitations like the integrated battery and the slots for the memory and M.2 drives, which are tricky to access. This means you cannot extend the battery runtimes and it is not easy to upgrade the components. The missing business features and some similarities with the gaming notebook could scare off some users that put a lot of emphasis on compatibility and restraint. Everyone will like the comparatively inexpensive price of around 1,800 Euros (~$2255) at the time of the review and the long 36-month warranty period. ... fair price-performance ratio results in an attractive overall package. 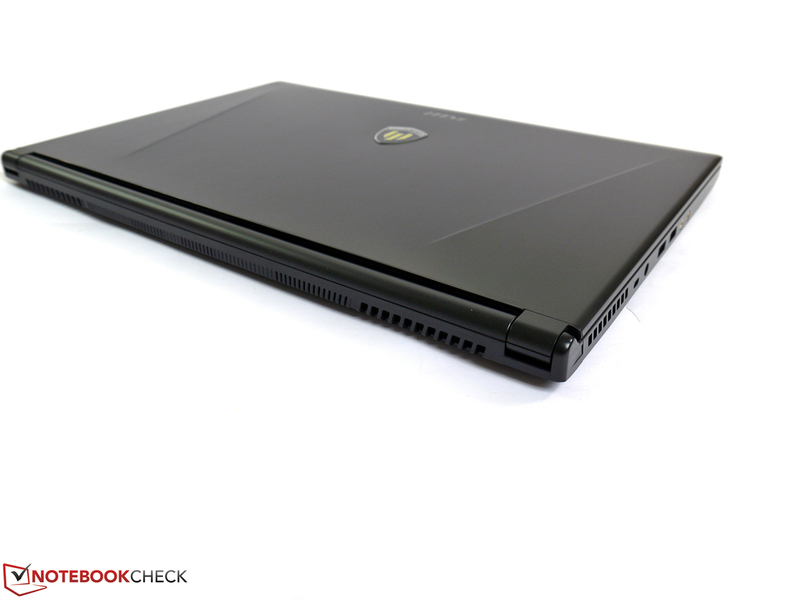 The basis is the gaming notebook MSI GS60. 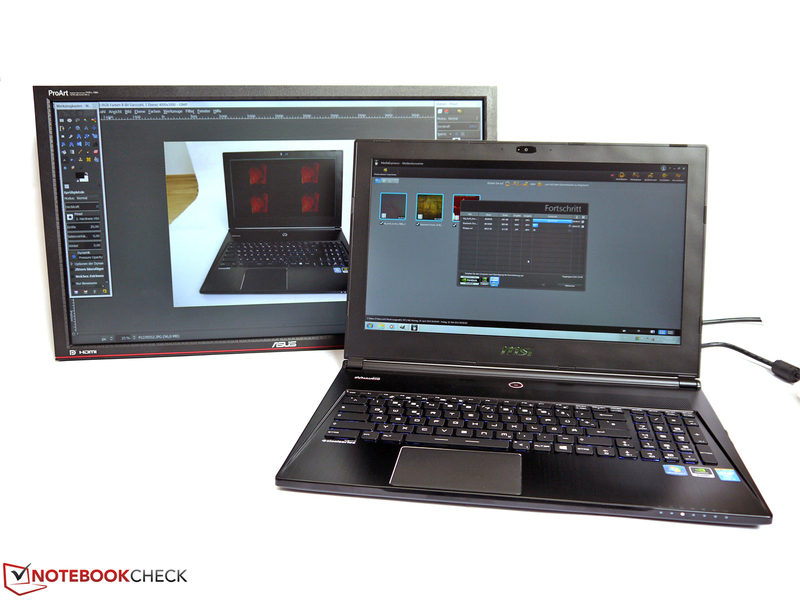 The big difference is Nvidia's professional Quadro K2100M GPU. 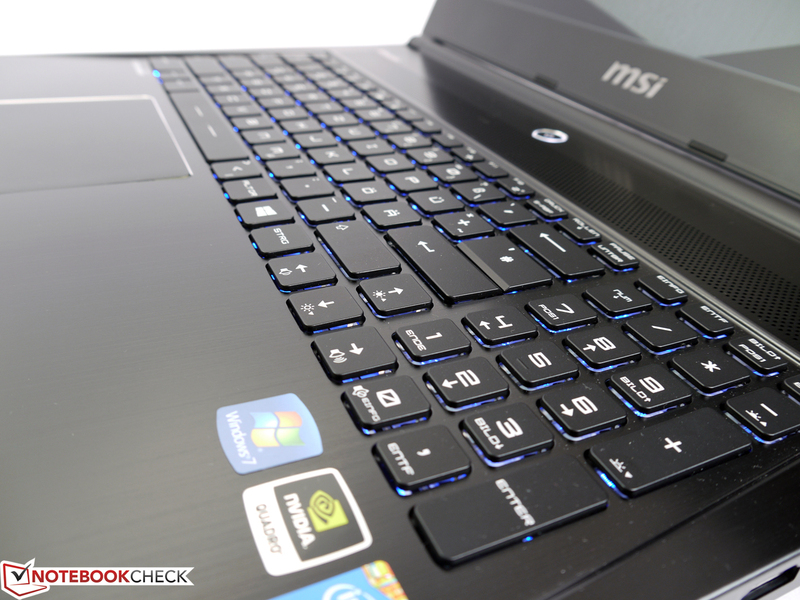 Many other features are similar to the MSI GS60. The maximum opening angles of the display is sufficient. The dual cooling solution is at the back. Build quality and stability of the case are good. The emissions of the MSI WS60 are conveniently restrained. All the ports are at the sides because of the concept. This results in limited space and can create some issues with attached cables and devices. 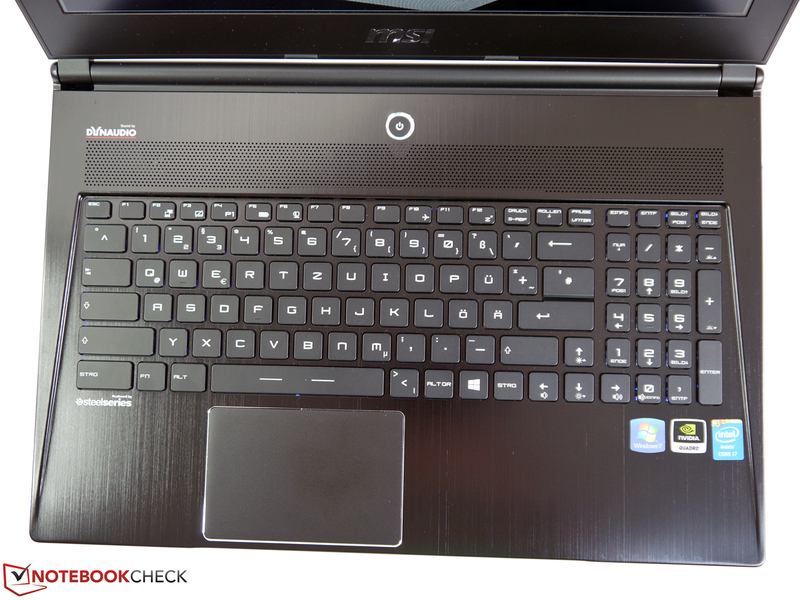 The keyboard mechanics leave a very good impression, but the layout is pretty unusual. The webcam does support 1920x1080 pixels, but is pretty standard otherwise. The confident logo could be a problem for restrained business customers. The keyboard illumination can be configured, including colored and pulsating. You can open the bottom, but memory and M.2 are hidden deep in the system. We measured the highest case temperatures in the center at the back of the bottom. Rubber feet provide good grip. According to MSI, you an use up to 2 external display at the same time. Solid, thin case with good performance, great display and a fair price-performance ratio in general. A real docking port, a better port layout and a replaceable battery. That MSI can compensate the drawbacks of the gaming platform and considers many demands of professional users.